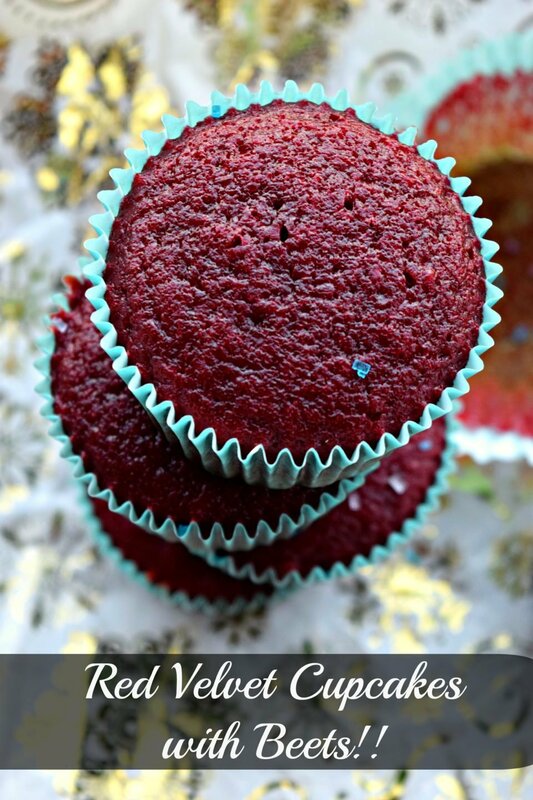 Eggless Red Velvet Cupcakes with no artificial color but made with beetroot puree. These cupcakes are delicious and the recipe is fail proof. Holiday recipes! “These Cupcakes have beets in it? ?”, “Did you really add beetroot in this cake?? “, “I cannot taste beets in this at all, thankfully!”, “I cannot believe that this is a beetroot cupcake!” were just some of the things I heard when I served these cupcakes at the Christmas party. All I could do was smile through all of it and nod in a yes! I myself was surprised that I had created a dessert using a vegetable. In fact, the last few days I have been challenging myself to create more and more such recipes which redefine cooking for me. I have been wanting to defy the norm by breaking the mold and come up with interesting combos when it comes to food. I got this inspirational idea from my favorite cooking series – Masterchef. Ever since I have been wanting to play with this idea and experiment with my palate. Just the other day, I made Beetroot Raspberry Sauce to serve along with Instant Rabri for dessert and Mango Kadhi for main course. This is something new for me and I am super excited to have set my foot onto this less traveled path. I hope to come up with more such recipes in the future for all of you. Fruits being used in savory food and veggies being used in desserts is my new year resolution for 2017! 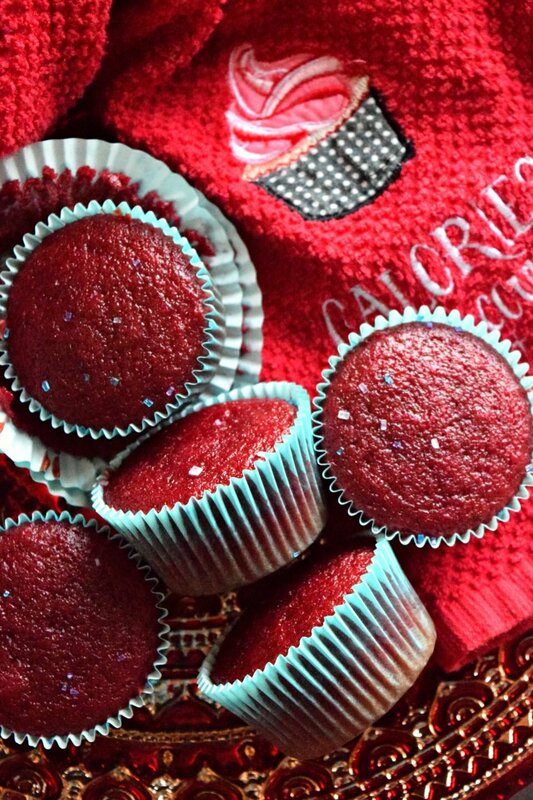 Eggless Red Velvet Cupcakes was KR’s demand from me for this Christmas. He told me well in advance that this is what he wanted to eat during holidays and that I should not give him any excuses for not making it. 🙂 He also told me to not tweak the original recipe and make red velvet cupcakes as is. Well, I made no such promise to him on that one. 😉 My devil mind (like he calls it) was already running over ideas on how to make these red velvet cupcakes different. While I am not a dessert person, red velvet cake is one of my favorite apart from cheesecake. Hence I was looking forward to create them in my kitchen and much as KR was looking forward to eating them. 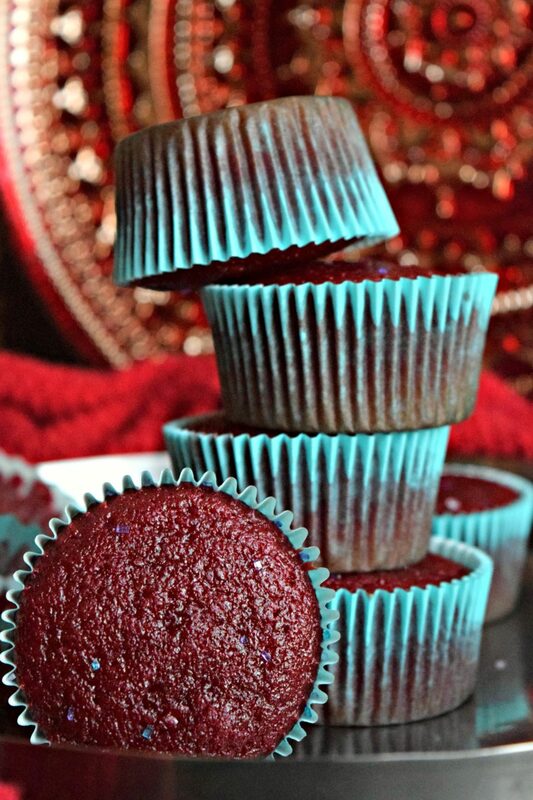 The basic recipe calls for red food color. All this time I though that there was a special ingredient which makes the cake red velvet. 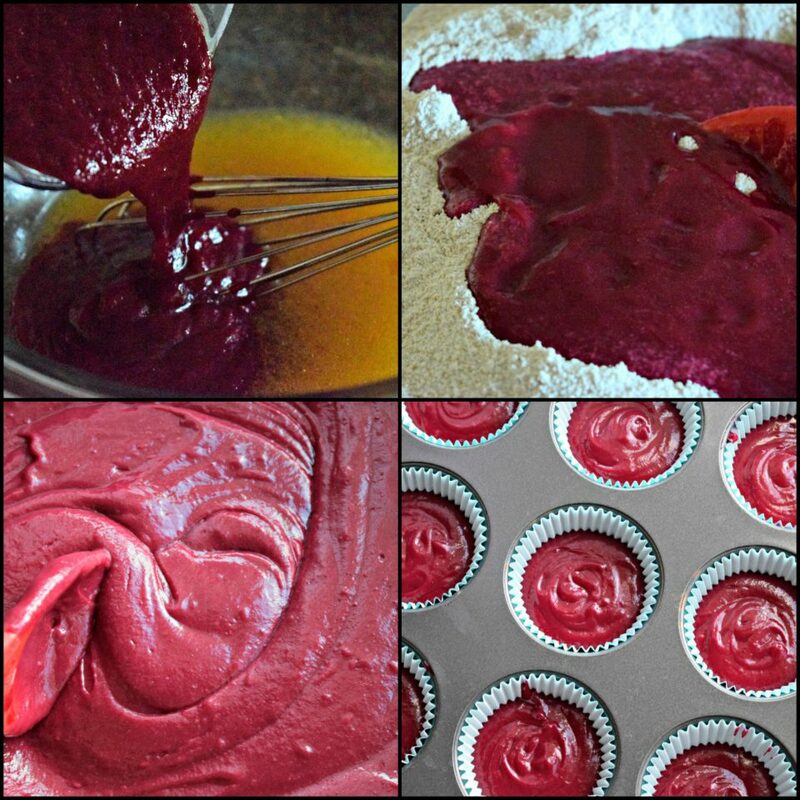 Only after going through a couple of recipes, I realised that it is just a regular cupcake recipe with red food color in it. I have used beets in savory dishes in the past like Healthy Pink Spaghetti loaded with Veggies, Healthy Vegetable Idlis in Pink, Teriyaki Noodles with Broccoli & Beets, Beetroot chilla stuffed with cottage cheese smeared in lettuce sauce to give the dish its deep red/pink color and that is how I got this idea to try using beets puree in making my cupcakes as well. 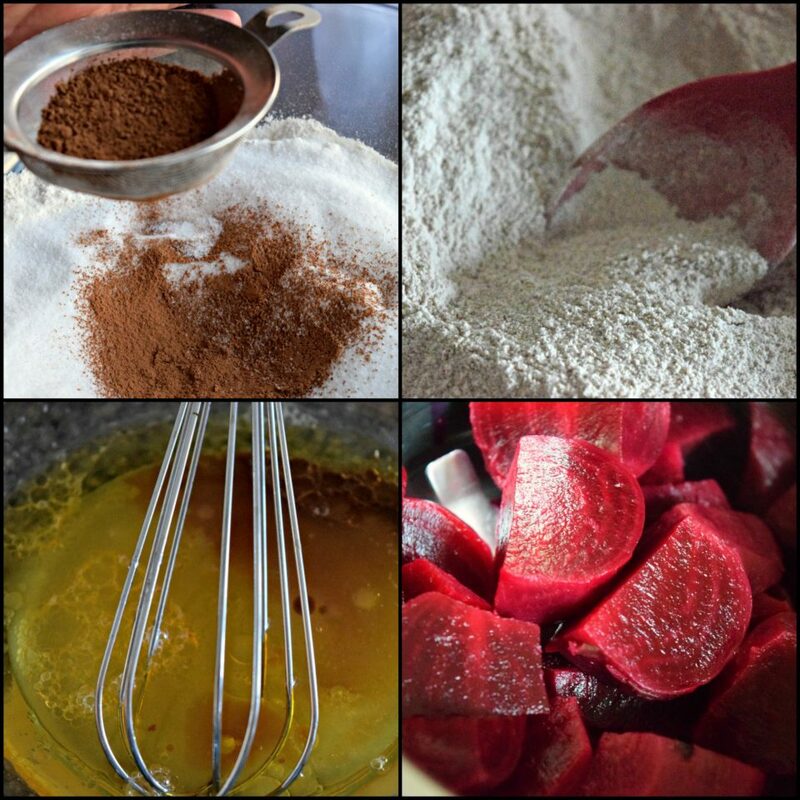 I was surprised to find a couple of recipes online which had used beets as well. I referred a couple of them and tried to create my own version with some changes. it to make a smooth puree. You may sieve this puree if required. to ensure there are no gaps. 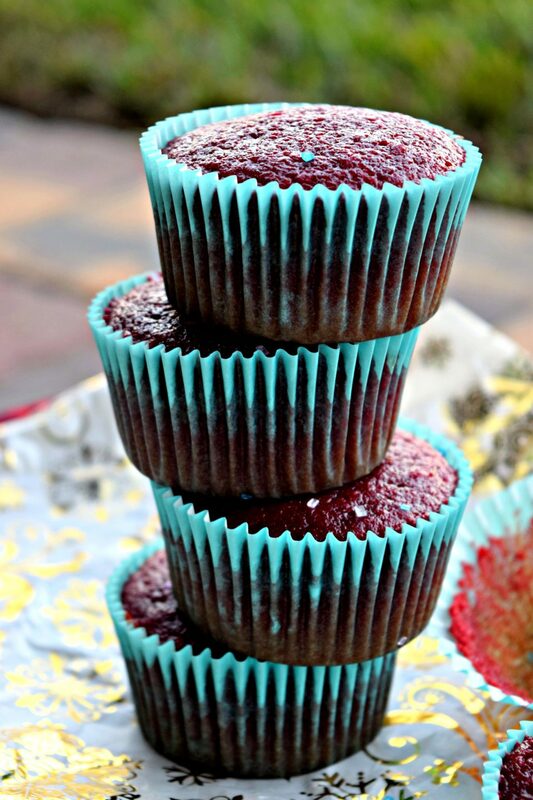 Preheat the oven to 400 degrees F. Bake these cupcakes for 30-35 minutes. Once done, take if out from the oven and let it cool for 5-10 minutes. Serve with any frosting on top or as is. This cupcake has a slight tang to it due to the lemon juice and I swear, you cannot taste the beets at all in it. 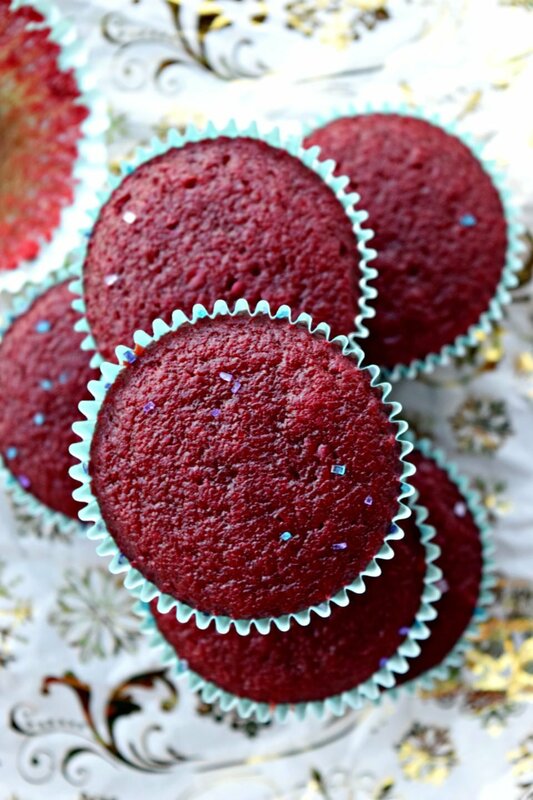 It just gives these cupcakes a deep red color which I love BTW. The cupcake is soft, moist and airy. I had made around 80 cupcakes for the Christmas party and let me tell you that I came home empty-handed. They were all devoured. I was super content and happy with this. It is always endearing to see people enjoy your food which you have prepared with lot of love and passion. 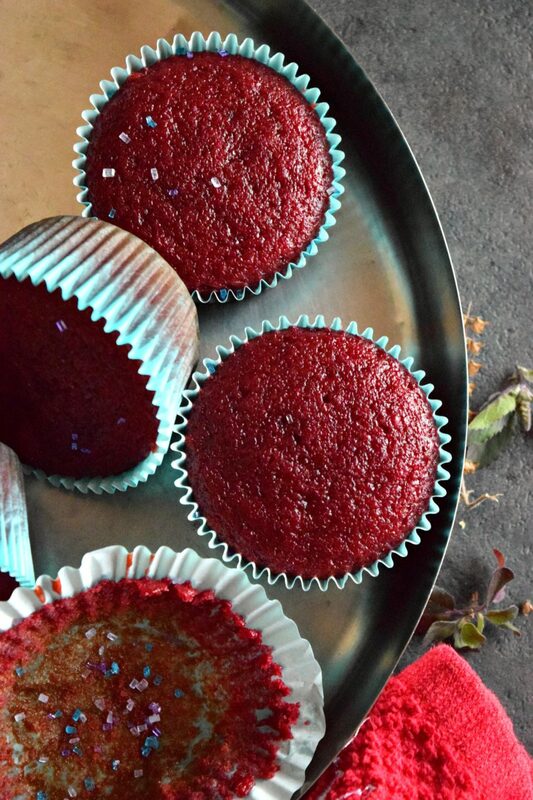 Eggless Red Velvet Cupcakes with no artificial color but made with beetroot puree. 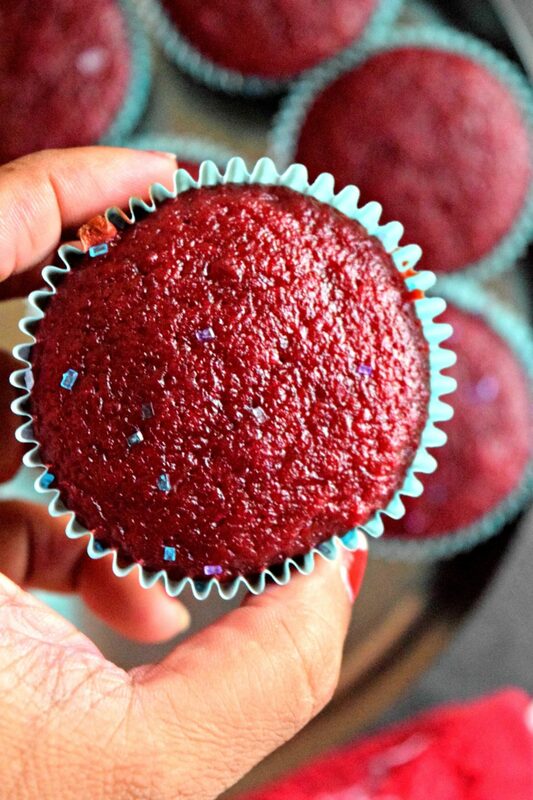 These cupcakes are delicious & the recipe is fail proof. Holiday recipes! Take a mixing bowl, sieve all purpose flour, baking powder and cocoa powder. Add salt and sugar, whisk it all together. In a separate bowl, add all the wet ingredients like oil, lemon juice and vanila extract. Whisk it. Peel and boil the beetroot and once it cools down, chop and blitz it to make a smooth puree. You may sieve this puree if required. Add this puree to the wet ingredients bowl. Whisk it together. Add this to the dry ingredients bowl. Fold in the mixture to form a cake batter consistency. Line a cupcake tray with cupcake liners. With a spoon, fill the liners 3/4. Lightly tap the muffin tray to ensure there are no gaps. Serve with any frosting on top or as is. Mine did not turn out red..they were brown 🙁 like chocolate cupcakes..what could be the reason? That is strange..the cake batter itself should be red in color..was it?